Maryhill Museum of Art founder Sam Hill was one of the Northwest’s first and most vocal advocates for modern roads. He was president of the Washington State Good Roads Association and spent much of his life championing the importance of highways in the Northwest. In 1913 Sam Hill convinced the Oregon governor and legislature to visit Maryhill and see the 10 miles of demonstration roads he had constructed over the prior four years, at his own expense, as a way to experiment with road building techniques and surfaces. Located off Washington SR 14, the historic Maryhill Loops Road was the first macadam asphalt-paved road in the Pacific Northwest. 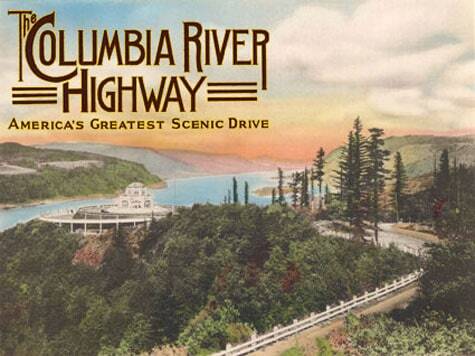 Prior to the construction of US 97, it served as the only road between the Columbia River and Goldendale, Washington. Historically, it was part of a larger road that encompassed several miles over which seven different experimental roads were constructed. 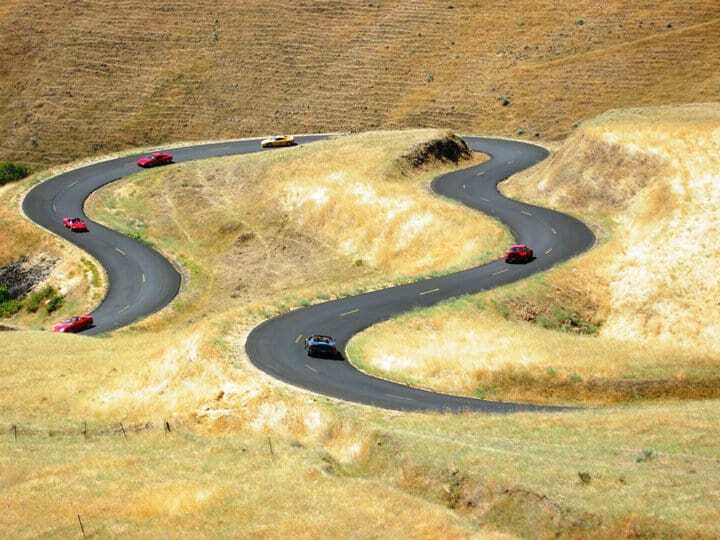 It rises 850 feet in a series of 25 curves, eight of them hairpin turns, at a grade of 5%. In 1998, a 3.6 mile section of the road was completely refurbished and received the Outstanding Project of Historical Significance Award from the American Public Works Association, Washington State Chapter. Take your car for a spin on the historic Maryhill Loops Road twice a year – during Members’ Appreciation Day and Car is King Weekend. Check our calendar of events for more information. The historic Maryhill Loops Road is located just east of US 97. Access is near the top of the grade, however a viewpoint is located on US 97. Click here for map. The road is open to the public for non-motorized use from 7 a.m. to 5 p.m. most days; admission is free. The historic Maryhill Loops Road is available on a rental basis for special events, including tours by car and motorcycle clubs, as well as for bicycle, skateboard and car races. Rentals are also available for commercial purposes, to the advertising and movie industries. For information about renting the road for exclusive events contact the museum at 509 773-3733 or email: events@maryhillmuseum.org. IMPORTANT INFORMATION: Use of the Maryhill Loops Road is at the user’s risk (Washington State Law, RCW 4.24.210). Maryhill Museum of Art assumes no liability. The road is steep, has blind corners, switchbacks, drop-offs and gates. Users should be aware that wildlife, domestic animals and people may be on or near the road. The Maryhill Loops Road is made available for the enjoyment of the public. In order to keep this area accessible, we ask that you treat the property with respect. When you leave, please make sure you take with you any garbage or trash. Overnight camping and fires are not permitted. Defacing private and public property is a crime; vandals will be prosecuted. Funding for the restoration of Maryhill Loops Road was provided by the Washington State Good Roads and Transportation Association; City of Goldendale; Goldendale Chamber of Commerce; and the Maryhill Community Council. Major support was provided by the U.S. Department of Transportation Enhance Program through the Intermodial Surface Transportation Efficiency Act through the Washington State Department of Transportation and the Klickitat County Road Department. After the Governor of Oregon and members of the legislature visited Maryhill to see Sam Hill’s experimental road, that paved the way for construction of the Columbia River Highway, which Hill envisioned as “…a great highway so that the world can realize the magnificence and grandeur of the Columbia River Gorge.” When it was completed in 1916, the highway was described as an engineering masterpiece; today it continues to delight travelers as it snakes along cliffs and waterfalls on the south edge of the Columbia River Gorge. Hill was also instrumental in the construction of the Pacific Highway (Highway 99, the main north-south route through Oregon and Washington), Highway 101 along the coast, and a road to Crater Lake.